BSC Paints has been in the business of protecting & enhancing effective service life of plant & machinery and national infrastructure with its high performance coatings, meeting the highest international standards, through a process of innovation & continued improvements, while meeting or exceeding the requisite legislation of business & environment. Our R&D capabilities, production infrastructure and countrywide marketing network with dedicated, qualified & experienced team have enabled us to achieve the status of total solution providers to our valued clients, in terms of problem identification, development & supply of specific product to meet their specific needs. BSC’s well equipped state-of-the-art R&D setup, supported by efforts of a team of dedicated scientists, has been instrumental in revolutionizing the protective coatings industry. BSC Red Oxide Zinc Chromate Primer is anticorrosive primer based on phenolated alkyd medium, red oxide of Iron and Zinc Chromate pigment. The primer is suitable for steel and light alloys in mild to moderately corrosive atmospheres. It is compatible with a wide range of top coats, e.g. 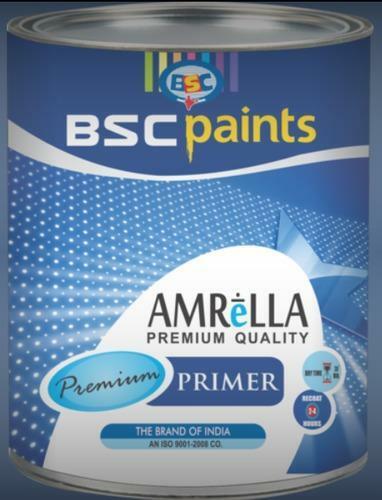 synthetic enamels, bituminous paints, aluminium paints etc. The primer also conforms to IS: 2074.
for corrosive, coastal and chemical environments. Fluid pressure 2500 – 3000 psi. Pot life: 4 - 8 hours. Surface dry 2 - 3 hours. Alkyd based, single pack zinc chrome primer for ferrous surfaces.